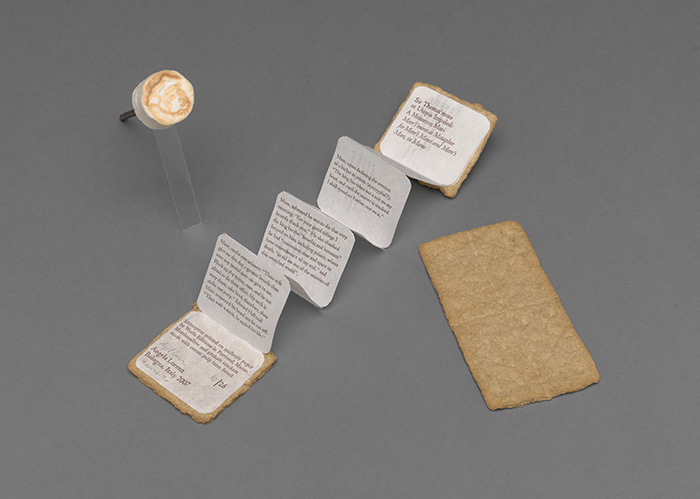 A perennial favorite among classes held at Houghton for its physicality and play-on-word title, this graham cracker bound accordion book and accompanying paper marshmallow were originally created as a remembrance of the death of Thomas More, whose classic Utopia (1516) satirized contemporary European society. Until his execution by Henry VIII for upholding his Catholic faith, More maintained a keen sense of irony. In “S’more” Lorenz celebrates More with layered upon layered reference to his life and works. The Library’s Food and Drink Policy notwithstanding, this delightful artist’s book is the only “food” we welcome in our stacks!